I thought I was going to add Spoonbill to the lengthening list of birds that have been seen at Druridge this year - just not by me (which includes avocet, little ringed plover, hooded crow, spotted redshank, med gull and more), but thankfully it's on my list. It wasn't this morning though, I've been to Manchester over the weekend, then to the match on Sunday and Monday was just too damned windy for any birding. Four spoonbills were reported at 6am this morning but there was no sign of them when I got there at 8.40. So, a post-work visit was in order, no sign of them from the Budge screen, the wind was still quite strong but they are big birds, surely they couldn't be hiding? A walk around tot he little proved that one, and only one, was hiding. Where have the other three gone...who knows? Four black-tailed godwits flew in whilst the spooner slept (why are they always asleep? 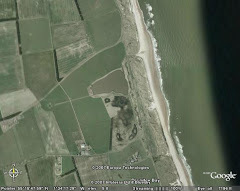 ), they couldn't find anywhere to land because of the dense vegetation at Druridge and continued north. Two male yellow wagtails having a bit of a tussle was also nice to see. Territory mapping tomorrow - 5am start!